I love me a good brown gravy meatloaf recipe, don’t you? There’s just something warm and comforting about this particular meal that makes me have feelings of nostalgia. it’s probably due to the fact that my mother would quite often make our family a hot and hearty meatloaf meal on those cold Michigan winters. There was nothing better than coming home from school to the aroma of mom’s meatloaf baking in the oven. I enjoy making this meatloaf on Sunday afternoons. It’s the perfect after-church meal and you can let it bake in the oven at a low temperature. The food will be ready when you get back. Position rack in middle of the oven. In a large mixing bowl, whisk eggs. Whisk in broth, ketchup, parsley, mustard, rosemary, pepper, garlic powder, and salt. Stir in onions, bell pepper, celery, and cheese. Crumble meat over egg mixture, followed by the dry bread crumbs. Using your hands, mix gently but thoroughly until all ingredients are evenly incorporated. Transfer meat mixture to a large, glass, rectangular baking dish (I use one that measures 10 x 15.) Spread the meat mixture into the pan as you would a cake, smoothing the top with a spoon. Bake uncovered for 1 and 1/4 hours, or until the top is crusty and well-browned and a meat thermometer reads 145 degrees F. when inserted into the center of the loaf. Allow loaf to stand at room temperature for 10 to 15 minutes prior to cutting it into pieces. Cut into pieces and transfer pieces to a large serving platter. Cover with heavy-duty aluminum foil while you make the gravy. Place meatloaf drippings in a medium saucepan. Heat until gently simmering. Add butter. Combine water and cornstarch in a cup, using a fork to whisk them together. Slowly add the cornstarch mixture to the bubbling gravy and whisk in, stirring constantly, until thickened. Salt and pepper to taste. Serve over meatloaf and mashed potatoes. 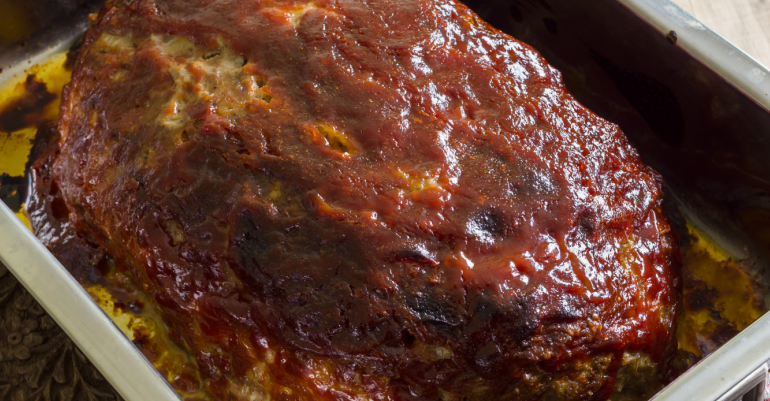 Quick Tip: Serve this yummy meatloaf with mashed potatoes and your fave steamed veggies.